The United States Arsenal in Fayetteville, North Carolina was destroyed by the same government that commissioned its construction. After the War of 1812, the U.S. wanted to expand its defenses and commissioned the construction of five arsenals. Fayetteville, NC was chosen as a site for one of those new arsenals. By 1858, just three years prior to the Civil War, the arsenal facility was just about complete. When North Carolina seceded from the Union in April 1861, local militia took the arsenal, turned it over to the State of North Carolina, who in turn gave it to the new Confederate States of America. The Confederacy used the arsenal to produce rifles, ammunition, and gun carriages. Union troops, commanded by Gen. William T. Sherman, destroyed the facility in 1865. Visitors can explore the site, which contains extant ruins with explanation signage; a steel semblance of the Northwest tower called the "ghost" tower; and two Civil War Trail markers. 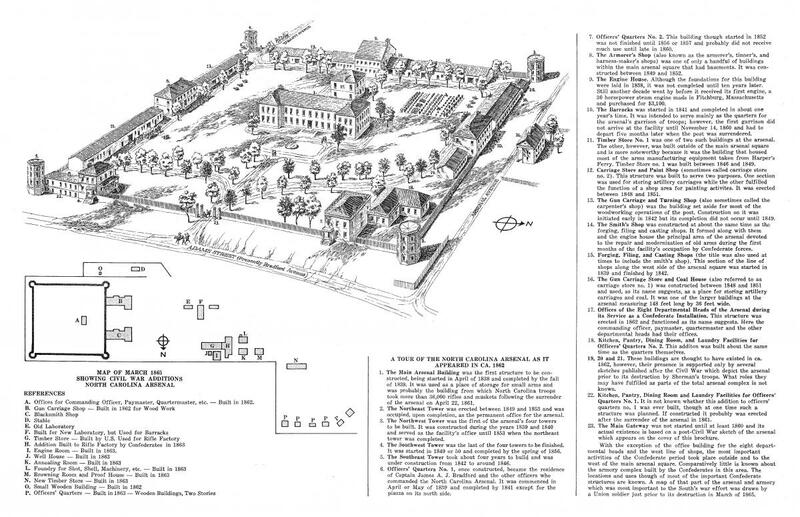 Click for a full diagram of the North Carolina Arsenal. A color-splashed version done in 2014 by a museum volunteer.